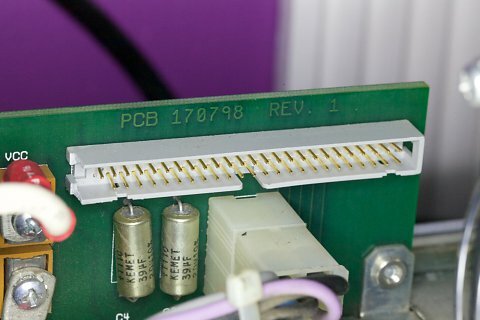 Well, I was installing a new hard drive into the XL1201 today and just before I connected the SCSI cable, I noticed a pin seemed to be missing on the 50-pin SCSI male connector on the backplane. On closer inspection, it's definitely missing. Fortunately, it seems to be pin 1, which is a Ground pin on both single-ended and differential SCSI. Since half the pins are ground on single-ended SCSI, that's fine, and there are still quite a few ground pins on differential, so we're fine. It's the bottom left pin in the picture here. In the worst case, the backplane could be disassembled and a new SCSI header installed, as it's a through-hole piece of equipment. I had noticed when I had first received the machine that the left side of the male header was broken off, but didn't investigate further. Maybe I should have! On the positive side, the XL1201 still boots nicely!